Campos is a typical agricultural town in the south of the island of Majorca, in the county of Mid-day (Comarca de Migjorn), and its population is about 8000 inhabitants. 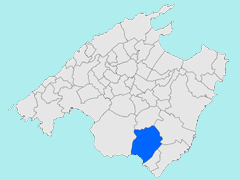 Campos is the county seat of a municipality - the fertile red earth - living mainly in irrigated agriculture (the caper for the production of capers (tàperes), almond and alfalfa as fodder for cattle) and dairy farming, the town produced cheeses, such as requesón, fresh cheese. 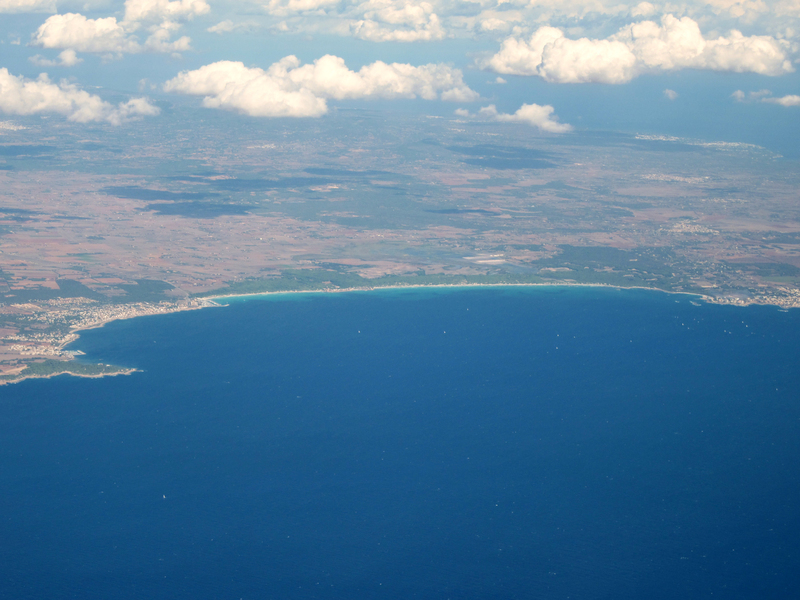 On the coast, a small seaside resort, Sa Ràpita, developed from the villas of the inhabitants of Campos, it has nearly 1,000. 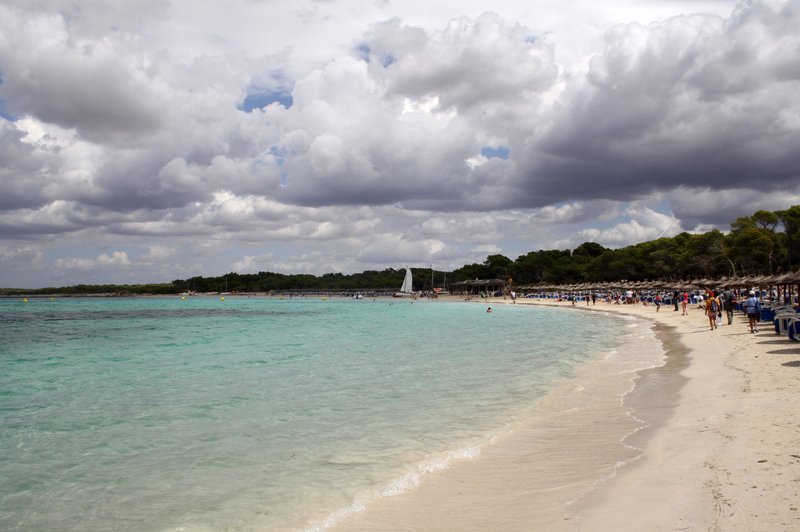 The Campos coast is famous for beach of Es Trenc, one of the largest natural beaches - and largely naturist - Majorca. The name Campos comes from the Latin word "campus" field caked in Mozarabic plural ending "-os"; the region of Campos is indeed a vast plain covered with fields and marshes. 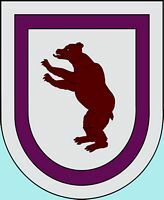 A whimsical folk etymology is that "campos" is a contraction of "camp" field and "ós" bear, "field of the bear". This is why the presence of a standing brown bear ("a bear rampant" in heraldic language) on the crest of the city, but there has never been a bear on the island of Mallorca. Like many Majorcan towns, Campos was founded in distance from the coast (10 km), not to be attacked by surprise by the Barbary pirates. 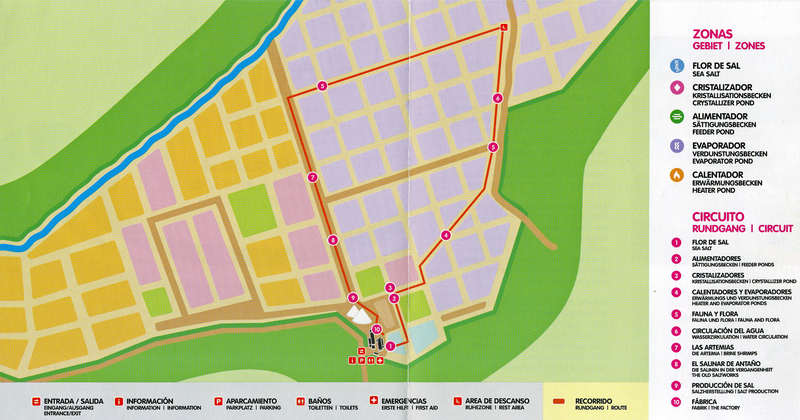 Campos is 41 km (¾ hour drive) from the capital, Palma, halfway between Llucmajor and Santanyí on the road Ma-19. The resort of Colónia de Sant Jordi is distant 14 km to the south. 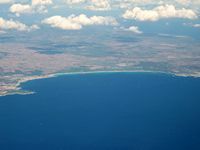 The municipality of Campos borders the towns of Llucmajor west of Porreres north of Felanitx northeast of Santanyí southeast and Ses Salines in the south. The town of Campos was founded by King Jaume II in 1300, to defend the city against the incursions of the Barbary pirates, seven defense towers, rectangular in plan, were built in the sixteenth and seventeenth centuries: the towers of Sa Torre, Son Cosmet, Can Bragues, of En Catlar, Can Dameto, Can Francina and Can Cos. Can Cos tower, built in 1642 and located near the town hall, now houses the municipal services. 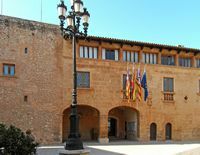 The town hall occupies a mansion built in the seventeenth century, in 1642, from a Renaissance building of the fifteenth century. The city of Campos, a little sleepy, comes alive on market days, Thursday and Saturday. The parish church of St. Julian of Campos was built between 1858 and 1873 on the site of the old parish church, built from 1519 to 1560. 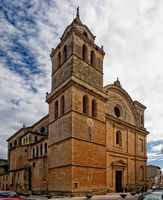 The old church were preserved bell tower of the sixteenth century and two chapels of the eighteenth century: the Chapel of St. Lucia (Capella de Santa Lucia) and the chapel of the holy Doctors (Capella dels Sants Metges), Saints Cosmas and Damian. The building is neo-classical style. in the chapel of the Body and the name of Jesus (Capella del Corpus i Nom de Jesús), an altarpiece by Rafael Blanquer, son of the architect and sculptor Jaume Blanquer. a Gothic altarpiece of Majorcan Gabriel Móger (1380-1438), "Nostra Senyora the Llet". The parish museum, located in the sacristy has a large collection of chalices. To visit the church and the museum, you can ask for the keys to the rectory (rectoría) Carrer Bisbe Tallades, 17. The Oratory of St. Blaise is one of the oldest chapels in Mallorca, built shortly after the conquest of 1229, it is mentioned in 1248 in a bull of Pope Innocent IV. The building is early Gothic style, with a single nave covered with a vault. Next to the chapel is a small botanical garden of native plants, the garden was the old cemetery until 1845. Each February 3, the day of St. Blaise, a party is held in the village of Sant Blai, and a Mass is said in the chapel. The Oratory of St. Blaise is 3 km south of Campos, on the road Ma-6040 leading to Colónia de Sant Jordi. The hot spring of Sant Joan de la Font Santa is the only hot spring in the Balearic Islands. Its water flows at 38 °C and is salty and slightly radioactive, and is supposed to have healing properties against skin diseases, rheumatism and arthritis. The source has been known since Roman times. The baths were rebuilt in the thirteenth century, after the reconquest. In the sixteenth century, the source was known to cure scabies and there existed a "District Mangy" (Quarto of Ronyosos / Cuarto de los Sarnosos). The source is mentioned in an atlas of thermal springs in Spain published in Amsterdam in 1638. The current spa was built by the state in the middle of the nineteenth century (1844), Marquis Palmer who donated the land. It was privatized in 1910, after many years of neglect, the spa was transformed into a luxury hotel and spa, access to the public baths still possible for a reasonable price (about 16 €). The hot spring Sant Joan de la Font Santa is located 3 km north of Colónia de Sant Jordi. Sa Ràpita is a quiet resort and a bit dated, with small houses that extend behind a good marina. From Sa Ràpita to Ses Covetes stretches a sandy beach. 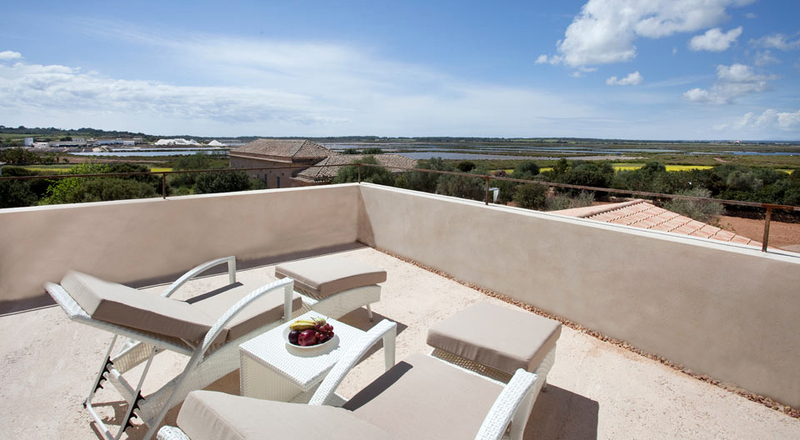 The saltworks of Salobrar de Campos, also called saltworks of Es Trenc, are the largest salt marshes of the Balearic Islands, occupying an area of 135 hectares, advancing deep inland. The saltworks are partly in the protected area of Es Trenc, on the back of the famous beach of Es Trenc. The saltworks of Salobrar were used since antiquity, but it was not until the nineteenth century that their production was industrialized. Since 1958, the salt are operated by the company Saltworks of Levant (Salines de Llevant / Salinas de Levante), which produces about 10,000 tons of salt per year, the production is made ​​in the traditional way: in the spring, the water of the Mediterranean is pumped from the beach of Es Trenc, 900 meters away, and sent to the salt marshes by long canals, sea water then passes through a series of large square basins (carnations) where it evaporates during the summer under the action of sun and wind months at the beginning of autumn, the salt is harvested and dried in the form of large mounds, sparkling in the sun. After cleaning and conditioning, the salt is ready for sale. 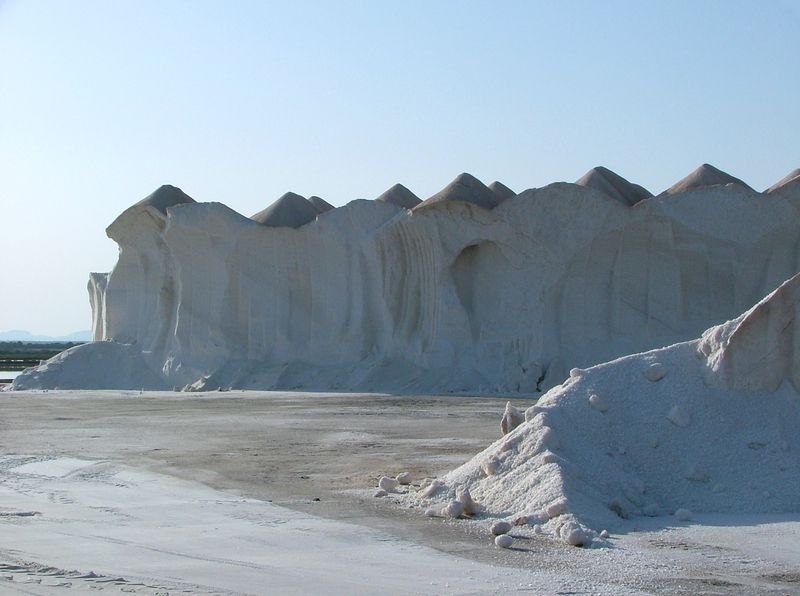 This natural salt quality - more expensive, but better and richer than the refined salt from rock salt salt mines - is intended largely within the market Mallorca, a small portion is exported. 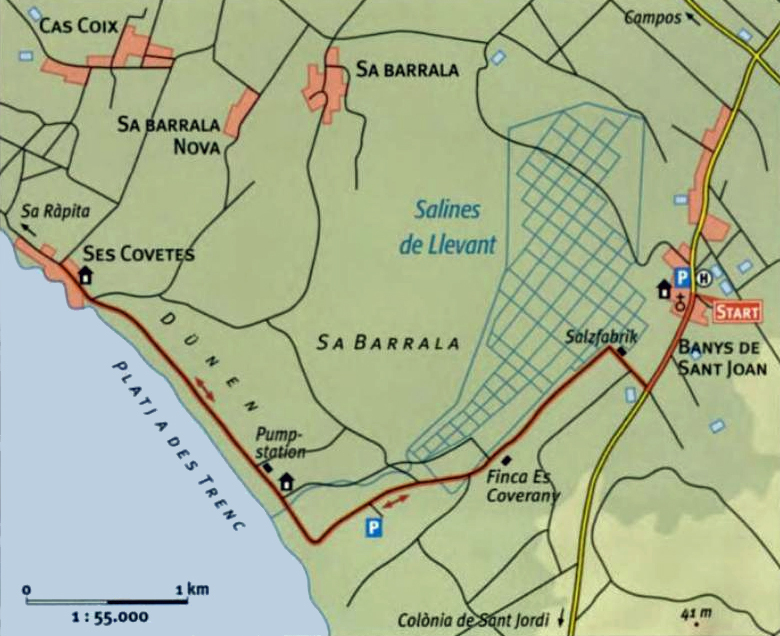 The saltworks of Salobrar are near the road to Campos to Colónia de Sant Jordi, 4 km before Colónia, a small road bears to the right towards the beach of Es Trenc, saltworks are shortly after the bifurcation. A small car park has a few places to park (parking is prohibited on the road to Es Trenc). The tour is more interesting in late August and early September, at the time when the salt is harvested. Hourly tours (for groups of 2-15 people): from April 1 to October 30, at 10:30, 12:00, 16:00 and 17:30. Duration of the visit: 1:30. You can buy salt to the small shop saltworks (La Tienda) a kilo of natural salt is sold around 2 €. You can also get hold of "salt flower" (flor de sal), a precious salt flush with the surface of evaporation ponds. 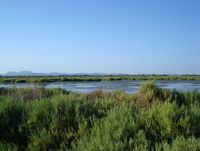 Around the salt marshes of Salobrar between Sa Rapita and Colónia de Sant Jordi, runs a nature reserve classified ANEI (Área natural d’especial interès) whose flora and fauna are protected. 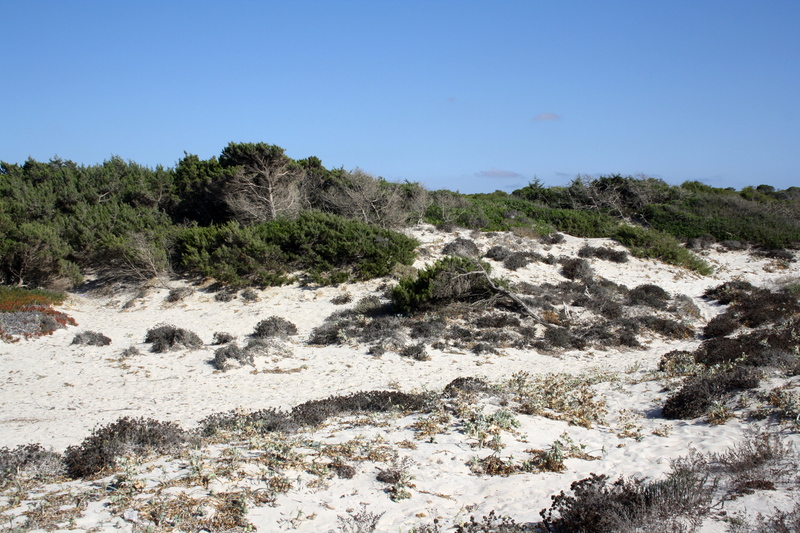 This protected 1 500 hectares, long over 7 km area includes dunes and beach of Es Trenc. We meet a particular vegetation tolerant to salt: salt-tolerant plants such as samphire or samphire or sea fennel (Crithmum maritimum), tamarisk or rushes. Y live or spend during migration, nearly 170 species of birds, many of which feed on small crustaceans that live in the salt. The area of saltmarsh is closed, but you can try to observe birds from the road to the beach of Es Trenc, which is visible the southern marshes. The beach of Es Trenc is a natural beach - and, in part, naturist - sandy, 3 km long and 22 m wide on average, located in the protected area and unbuildable of Salobrar. The natural setting of the beach has been preserved thanks to the strong involvement of local people, frightened by concreting other beaches on the south coast of Mallorca like S’Arenal or Cales de Mallorca; transformation projects of area, a golf course and a large resort, were stopped, while the first building permit had been granted. To the north of the beach, close to Ses Covetes, unfinished buildings, covered with graffiti, evidence of the fight against illegal constructions. 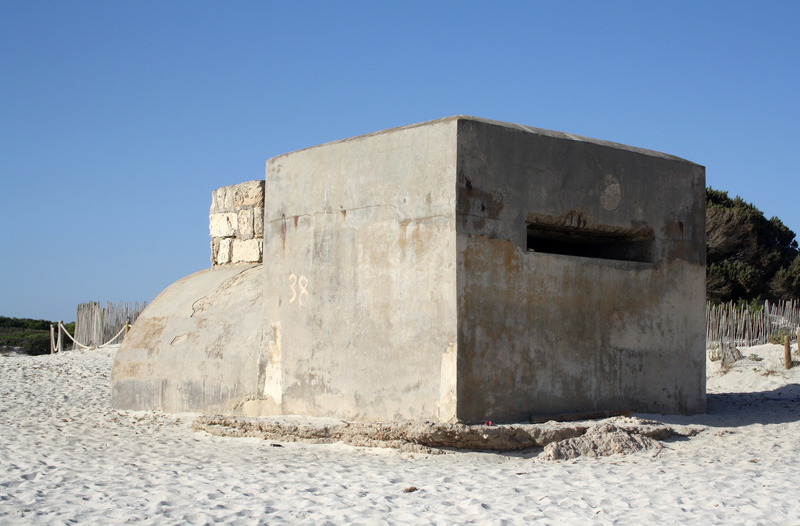 The only buildings "hard" on the beach are concrete bunkers built during the Spanish Civil War to stop the landing of troops "republican." Es Trenc is one of the most famous natural beaches of Majorca, but it is not a wild beach: the beach is usually crowded in summer, chairs and paid tight against each other umbrellas, bars disco-broadcast loud music, litter accumulates on the dunes near the beach, the small access road is very narrow and very crowded, parking is prohibited on this road, and the authorized parking is very expensive (€ 10) and saturated. The vaunted beach of Es Trenc can quickly turn into a nightmare. 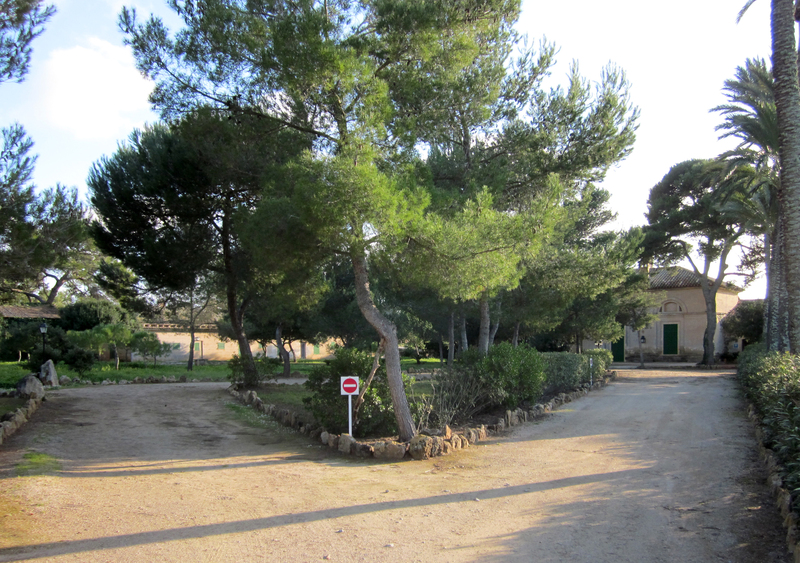 The range of Sa Ràpita, a little further west, after the hamlet of Ses Covetes is quieter. The name "Es Trenc" means "break": in fact, in the eighteenth century, the dune that separates the sea from the wet area of Salobrar, was broken by the tidal wave subsequent of the earthquake of Lisbon, in 1755. By road, the beach of Es Trenc is distant 11 km from Campos and 6.5 km from Colónia de Sant Jordi, but traffic and parking is difficult, moreover, the parking is quite expensive (€ 6). 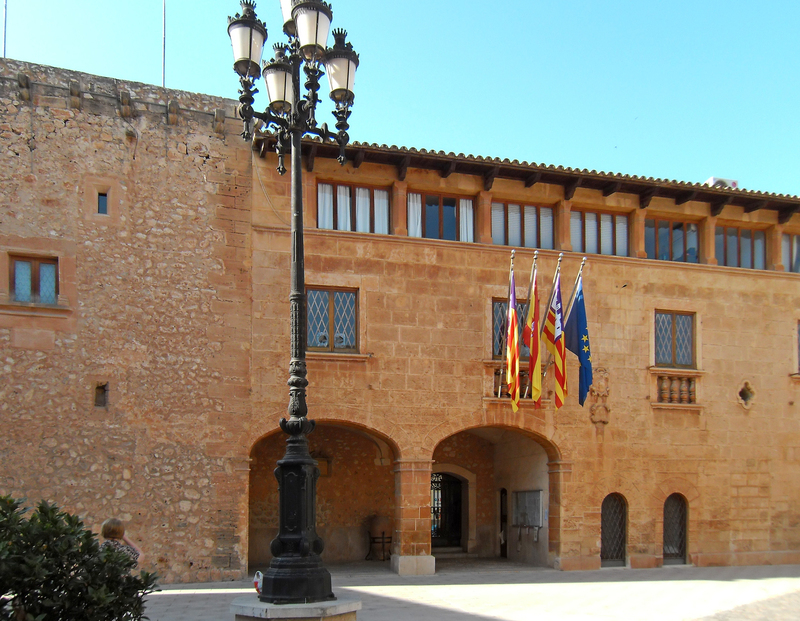 From the north-west of the seaside resort of Colónia de Sant Jordi, Es Trenc can be reached on foot in 30 minutes. 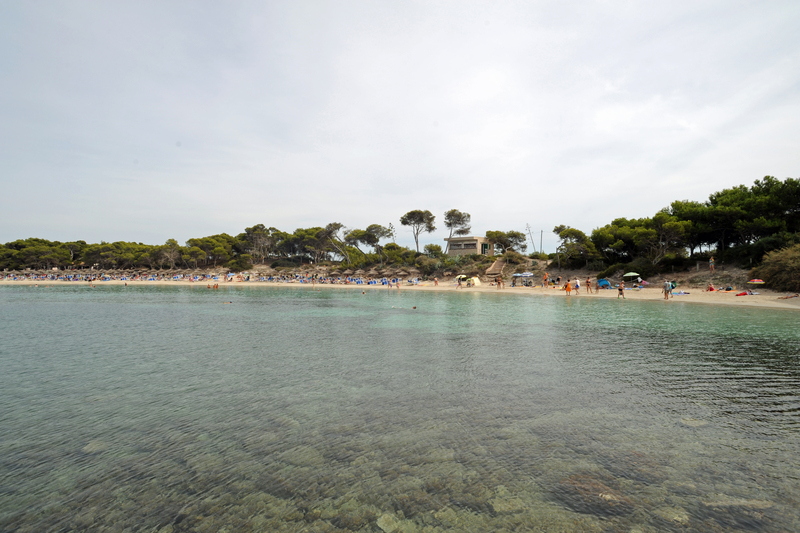 The beach of Estanys is the first beach of Campos, located northwest of the town of Ses Salines, the beach is adjacent to the resort of Colónia de Sant Jordi. 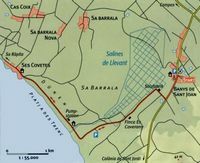 It is located in front of the saltworks of S’Avall, hence its name "beach of the Ponds", the beach is separated from the salt marshes by dunes where the growing sea lilies and sea holly. 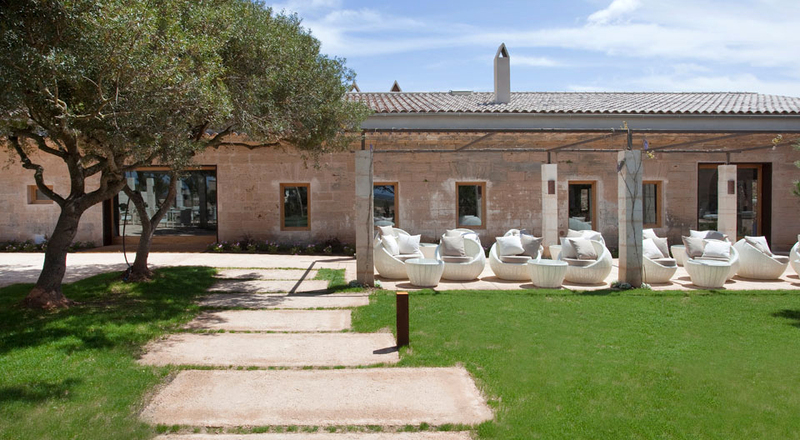 This luxury hotel is located in the Baths of Sant Joan de la Font Santa, the only thermal spring in Mallorca.